In search of an affordable, yet quality raw cacao powder, I stumbled upon a great company this week! 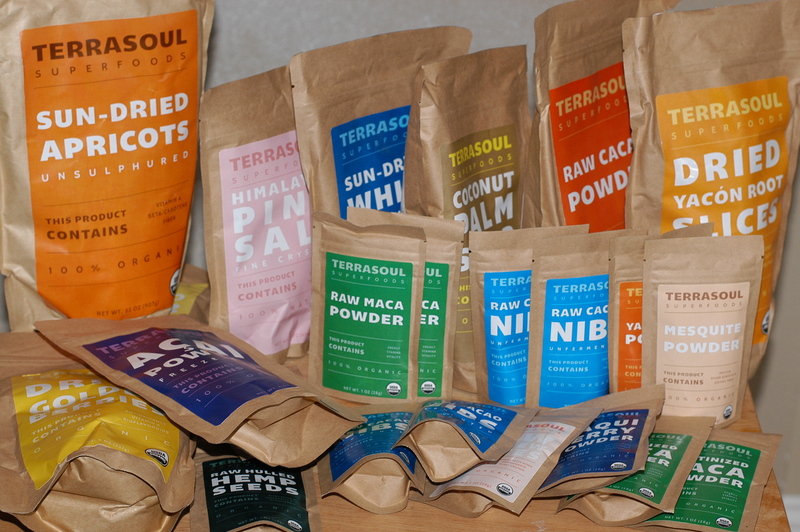 Terrasoul Superfoods, located in Houston Texas, is a GOLDMINE when it comes to organic & raw Super-foods. Yes, chocolate, more specifically Raw Cacao is a superfood! Loaded with antioxidants, magnesium and iron, raw cacao has been used for centuries as a health food. Unfortunately today, MOST of the chocolate we purchase in stores has been stripped of all it’s nutrition and is loaded with sugar. Up until this past week, I have been using unsweetened cocoa (not the Dutch processed kind) in my shakes and baked recipes. I knew to avoid the Dutch processed stuff, but I just had not made the switch to the REAL cacao because of the price. I use SO much of it day-to-day in my shakes and in recipe development, spending $20/lb would leave me broke! I went in search of a great product at an affordable price and I found it! After seeing the price of $12 for 1 lb of Terrasoul Raw Cacao Powder, I quickly ordered some not knowing that I was stumbling upon a gold mine of other great foods. I received my cacao powder very quickly (thank you Amazon Prime) and I immediately made my first shake. All I can say is YUMMY! 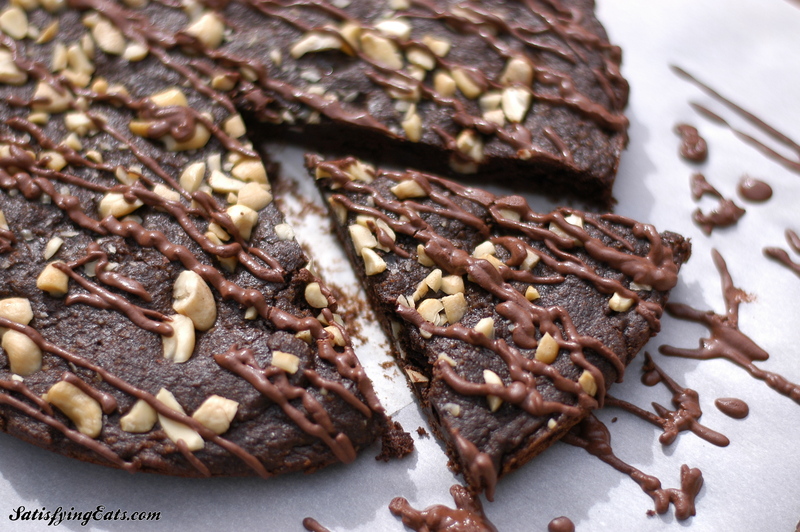 I was so inspired by the flavor of the cacao and all the nutrition I was getting, later that night I created a new recipe, this Triple Chocolate Cookie Cake. It was DELICIOUS and now I am hooked! The next day I contacted Terrasoul Superfoods to tell them how much I enjoyed their raw cacao. They were so gracious and sent me this OVERFLOWING box of their products to review and they offered to sponsor a giveaway of (2) $50 gift certificates to purchase their products! How awesome is that! ?!? 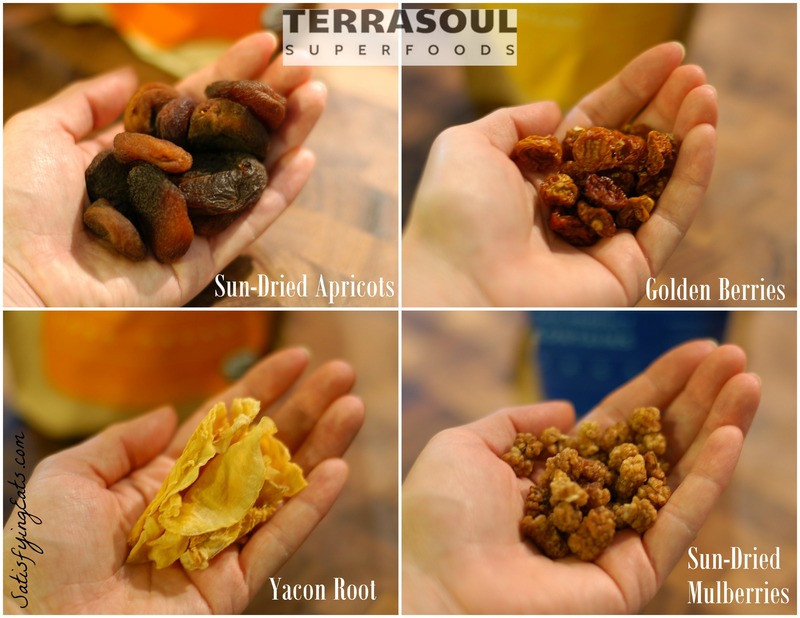 Terrasoul Superfoods has everything from Raw Cacao powder and Cocoa Butter to sun-dried apricots as well as super-foods such as Raw Maca powder and Acai Powder! In case you didn’t know, the temperatures at which certain ingredients are processed can greatly affect their nutritional content. Heat denatures many enzymes and can destroy vital nutrients just as heating olive oil to high temperatures causes it to become rancid and oxidize. I learned from the Terrasoul Superfoods website that during the processing of their raw cacao powder, temperatures never reaches over 114 degrees F to insure none of the nutrients and antioxidants naturally occurring in the cacao are damaged. So now when I add Terrasoul Raw Cacao powder to my smoothies and shakes, I am getting the most nutrition and still a delicious chocolate shake! I learned so much by looking at their site. I had NO clue of all the benefits of chocolate, certain berries and powders. And I love that the listed all of the nutritional information on their site! I am VERY excited to begin using some of their products in existing recipes as well as creating new recipes with ingredients that I have never used before, like cacao butter. 1. Raw Cacao Powder (REAL chocolate)– Contains a high concentration of magnesium and antioxidants. Cacao powder be used in the place of unsweetened cocoa powder in my chocolate recipes. I am updating all of my recipes that called for unsweetened cocoa powder to use raw cacao since it is a much healthier form of chocolate. Depending on how chocolaty you like a recipe, you may need to add just a little bit more of the raw cacao powder but equal amounts will still taste good. 2. Sun-Dried Apricots (unsulphured)– A great source of dietary fiber, antioxidants, carotenoids, vitamin A, polyphenols and potassium. My husband LOVED these and I had to remind him that I need them for my recipes. He says, “We can buy more.” My plan with the apricots is to chopping them and using them in a grain-free fruit cake! Also, dipped in dark chocolate for a nice treat! 3. Coconut Palm Sugar– Is a low glycemic substitute for sugar. It is rich in magnesium, zinc, iron and is a natural source of vitamins B1, B2, B3, B6 and C, which aid in the slow absorption of the sugar into the bloodstream. I use coconut sugar in small amounts to supplement the Kal Stevia when sweetening recipes. Coconut sugar, raw honey and Kal Stevia are the only forms of sweetener I use. 4. Himalayan Pink Salt– Is rich in minerals including calcium, magnesium, potassium, copper and iron. I began using Himalayan salt a few months ago. Due to its trace minerals, it is great for thyroid health. I like Terrasoul’s Himalayan Pink Salt because they sell both the large pieces and the kind already ground into a fine powder. 5. Raw Almonds & Cashews– Nuts are best eaten raw to preserve their nutritional content. MOST ALL nuts labeled raw are still pasteurized but Terrasoul ensured me that their nuts are TRULY raw. The raw almonds and cashews will be great for snacking or in my Granola Recipe! 1. Raw Dried Golden Berries– contain high levels of both bioflavanoids and vitamin A. Add them to your diet to boost your intake of anti-inflammatory and antioxidant-rich foods. These are quite yummy! They are sweet but tart. Kids would LOVE these (and adults too)! I plan on covering some of these with chocolate. 2. Sun Dried White Mulberries– These are an excellent source of nutrients including iron, calcium, vitamin C, and fiber. Again, my husband WOULD NOT stop eating them! They are not to sweet and have a great texture! I also plan on using them in my fruit cake. These would also be good in my upcoming recipe, Kitchen Sink Cookies! 3. Dried Yacon Root Slices– Have a delicate sweet taste and contain fructooligosaccharides (FOS). FOS taste sweet, but pass through the body undigested, so yacón root only contains about half the calories of an average sugar source. Yacón root also has a prebiotic effect, meaning it allows intestinal flora that favor colon and digestive health to flourish. These remind me of apple chips. Very tasty and great make a great snack. 4. Raw cacao nibs (fermented and unfermented)– Raw cacao nibs are made by removing the skin from the cacao seed and cracking it into small pieces. The cacao nibs remind me of coffee pieces. They are bitter because they are unsweetened but would be great blended with sweetener and/or cacao butter. I personally wouldn’t eat them straight out of the bag. 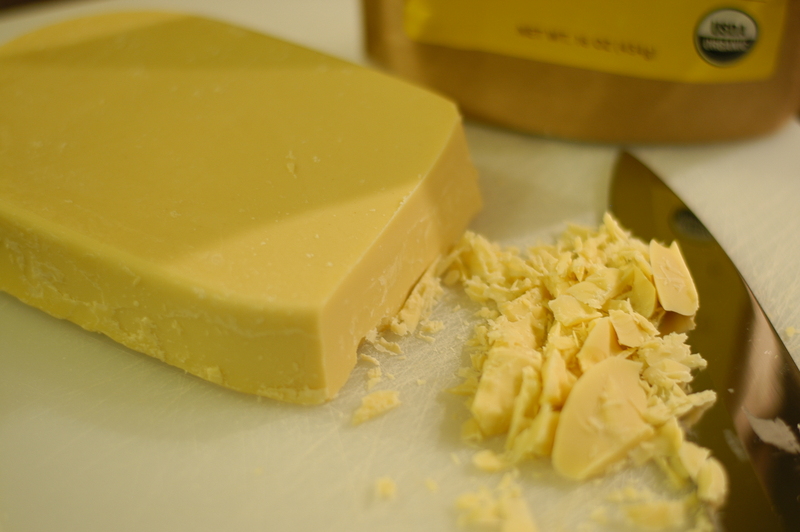 Raw Cacao Butter… the base for white chocolate! I am VERY excited to make WHITE CHOCOLATE, REAL White chocolate! I also used the cacao butter as the oil in the Triple Chocolate Cookie Cake recipe. These will be great in my smoothies too! 1. Yacon Root Powder– This powder is made from the same root as the chips above. The powdered form is a great sugar substitute. I tried adding it to my shakes for sweetness. It took about 2 tbsps to achieve the same sweetness that 2 small servings of Kal Stevia would achieve. 2. Gelatinized Maca Powder & Raw Maca Powder– Maca is most often regarded as a powerful stamina booster, libido enhancer, hormone regulator and exhaustion buster. Maca also provides an abundance of vitamins, minerals, amino acids and sterols that can support general health and immune function. I added this to my afternoon smoothie too! What a great supplement! 3. Mesquite Powder– Organic mesquite powder is extracted from the seeds of the mesquite plant, which is found in the southwestern United States and parts of South America. It has a sweet but nutty taste, and is used by many for flavoring in both food and drinks. It is rich in a number of vitamins, minerals, and amino acids. It has high levels of calcium and is a rich source of dietary potassium. 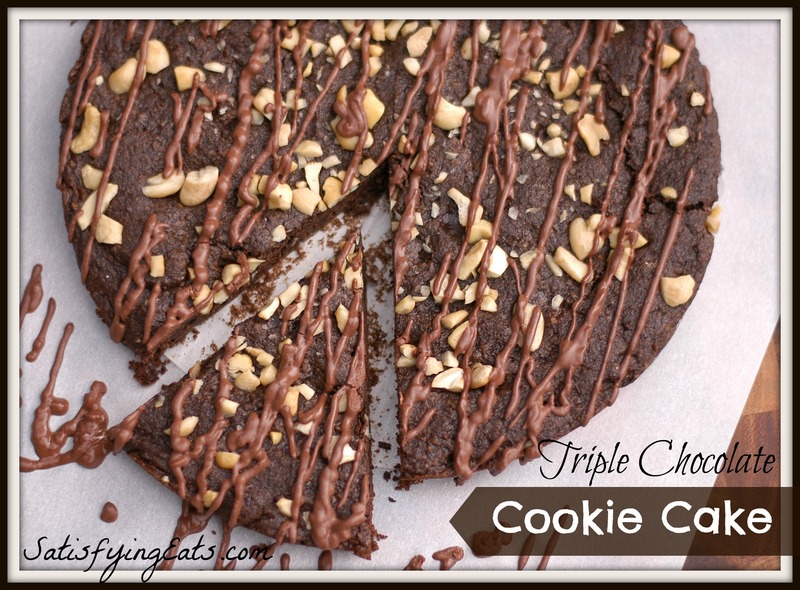 I have been adding this to my Chocolate shakes as well as 1 tsp to this Triple Chocolate Cookie Cake recipe to go with the chocolate flavor. 1. Maqui Berry Powder– Maqui Berries were consumed by the Mapuche Indians for centuries to improve stamina and strength in their warriors. Maqui berries contain the highest antioxidant value of any known super-fruit. 2. Acai Powder-Acai Powder contains an extraordinary antioxidant compound called anthocyanin, which is thought to have many health and anti-aging benefits with its ability to neutralize free radicals in the body, combat tissue damage and strengthen the immune system. Acai berries contain ten times more antioxidant vitamins than grapes and twice as many as blueberries. (Source) These are just a FEW of their superfood products. Check out their website for a full list, description and prices of their products. 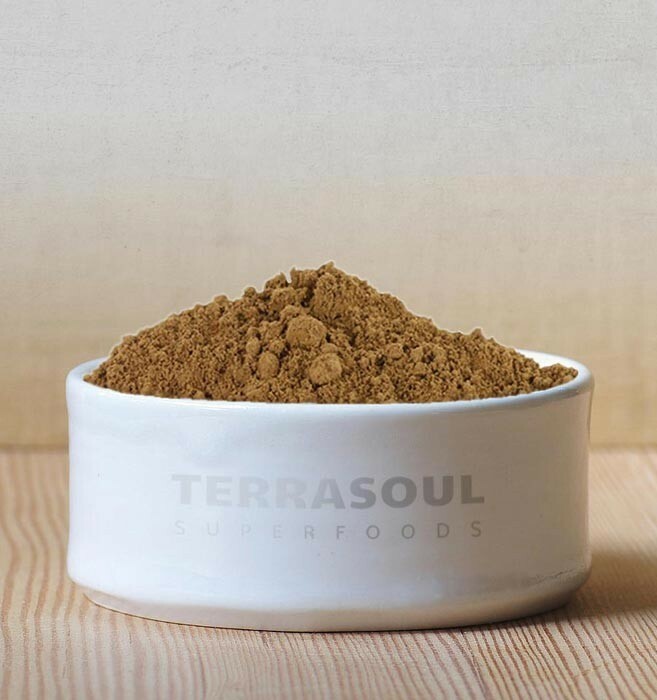 Compared to other companies online, Terrasoul Superfoods was very competitive and on most items, beat the price of their competition. In ALL honesty, I had NO CLUE to all the benefits of these super-foods! I knew raw cacao was good for you, and that coconut sugar and Himalayan salt were good choices, but until researching for this post, I didn’t know how healthy these other foods and supplements were. Lets heal and feed our body’s with the foods that God and nature intended! I think 99% of the human population LOVES chocolate. Maybe subconsciously our bodies crave it because it is SO healthy! Unfortunately, due to processing and all the added sugar, soy and flavorings, the chocolate products we buy in the store are no good for us and even harmful! 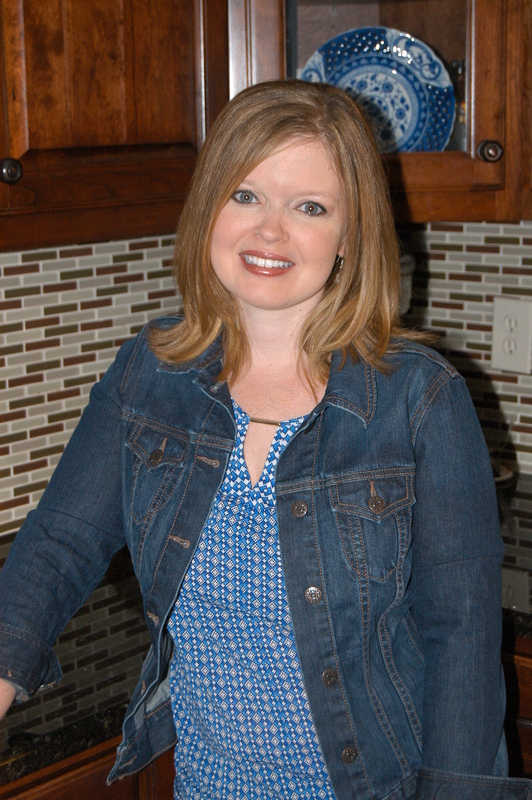 I have created about 50 recipes using chocolate between the blog and my 2 cookbooks. I have used unsweetened cocoa powder in the past but I will start substituting Raw Cacao Powder in its place from this day forward. 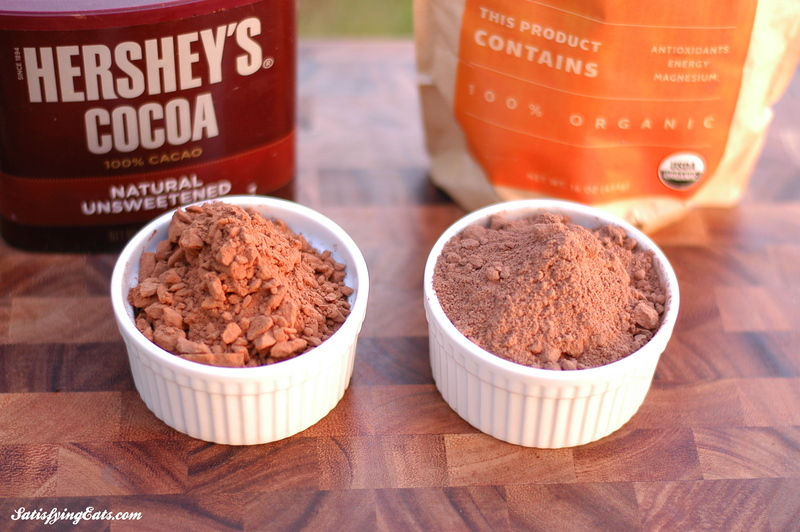 From my experience, when replacing unsweetened cocoa powder with raw cacao powder, the same measurements will apply. If you haven’t had a chance to order any Terrasoul Raw Cacao Powder, unsweetened cocoa powder will work fine but I STRONGLY encourage you to give it a try. Healthier and tastier chocolate!! I have been creating more nut-free recipes, primarily by using coconut flour. The problem with using only coconut flour is that sometimes it does not create the texture you want. Coconut flour worked PERFECTLY in my Banana Bread but for this cookie cake, I needed more structure. It needed almond flour. Did you know that you can substitute ground pumpkin seeds in the place of almond flour recipes, cup for cup! I made this recipe with both almond flour and pumpkin seed flour (that I ground in my Magic Bullet) and it worked PERFECTLY! Both versions taste AWESOME so use either one you would like. This recipe is intended to be dairy-free but you can always use butter if you don’t have the cacao butter or coconut oil. The Chocolate Drizzle is made using coconut cream concentrate which is the flesh of coconut ground into a creamy butter. If you don’t have coconut cream concentrate (or coconut mana as it is sometimes called), feel free to use THIS ganach recipe or THIS chocolate frosting recipe from my Copy Cat Little Brownie recipe. 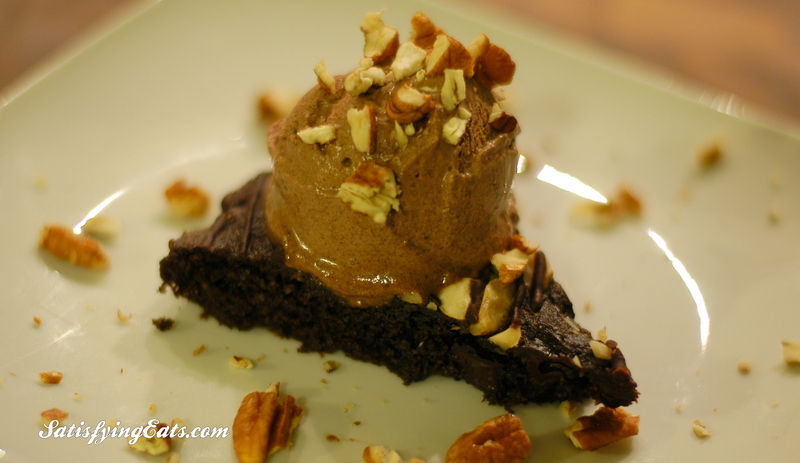 I used Terrasoul’s cacao butter in this recipe and it worked BEAUTIFULLY! It smelled like white chocolate, which is essentially what it is with out the milk solids, vanilla and sweetener. I melted it down in a small pot and then poured the right amount into the recipe. It was a beautiful golden color when melted. You could also use coconut oil or good ‘ol butter instead. In this recipe, I use a combo of Kal Stevia and coconut sugar. Feel free to use whatever sweetener you would like. Just be sure to taste your batter BEFORE you bake it. If it doesn’t taste good before you bake it, it won’t taste good after coming out of the oven! This is a REALLY easy recipe! One bowl, that’s it! The recipe calls for using parchment paper (not wax paper) to line the bottom of the pan. This is not necessary if you are going to just serve it out of the pan you bake it in. I knew that I needed to take pictures and didn’t want it to stick so I opted to use parchment. This made it a little more tricky to spread the thick dough, but it worked out. Also, Terrasoul is offering 10% off to Satisfying Eats readers on their website: www.terrasoul.com . Simply use the code “SATISFYINGEATS” as the voucher code during checkout. Preheat oven to 350 degrees F. Oil the sides and bottom of 8 inch cake pan. Line the bottom of the pan with parchment paper and set aside. In a medium bowl, add dry ingredients. Use a sifter to insure that all ingredients are blended well and that there are no lumps. Add remaining ingredients (except nuts and optional salt) to dry ingredients and mix. Taste for sweetness and adjust if necessary. Press (or spread with angled spatula) into a 8 inch cake pan. Sprinkle with nuts. Bake for 11-14 minutes. DO NOT OVER BAKE! Remove from oven and serve warm or allow to cool and top with Chocolate Drizzle. In a small bowl, blend coconut cream concentrate and water until smooth. Add cacao powder, vanilla and stevia. Whisk until creamy. Taste for sweetness and adjust if necessary. Spread or drizzle on the cooled cookie cake (or warm) or allow to harden just a bit and place in a piping bag to decorate. For a nice treat, top with ice cream before serving! Some of the links contained in this post are Affiliate Links. If you make a purchase through the links provided, I will receive a small (very small) commission which I used to buy more ingredients to create more recipes. This is at NO cost to you! I have chosen these products not to receive a commission, but because I think they are the best on the market. These are ingredients and equipment that I actually use. This commission helps compensate me for my time and justifies the hours a day that I spend in the kitchen creating recipes, on the computer posting blogs, and sharing helpful information with you. Melissa, the Satisfying Eats Girl! My favorite way to enjoy chocolate is a brownie. But really anything chocolate is good! I shared the giveaway and recipe photo on facebook. This recipe looks yummy! Looking forward to making it! Hope I win, I have items stored in my Terrasoul cart! I love almost anything chocolate! This cake looks amazing, can’t wait to try it. Brownies are my fave but cookies and smoothies are pretty close. my favorite way to enjoy chocolate is any way i can get it! love your recipes and blogs…and anything chocolate! I loooooove making homemade almond butter cups. You get both fantabulous chocolate and coconut oil at the same time! Thank you!!! My favorite way to enjoy chocolate is in a fudgy brownie. favorite way to enjoy chocolate is in hot cocoa…but I completely inhale brownies too! I love chocolate ice cream! Thanks for the giveaway! Oh yeah, forgot to tell you my favorite chocolate – so hard to pick one, but I guess I’ll say a delicious chocolate milkshake is usually the best! My favorite way to enjoy chocolate is truffles and really good mousse – smooth melty chocolate is my thing!!! My favorite is melted & mixed with peanut butter (and sometimes coconut oil)! My favourite way to enjoy chocolate is in home made chocolate mousse: avocado, a tiny bit of honey, and some cacao power. My favorite way to eat chocolate is in brownies, I think? Haha. It’s hard to pick!! I purchase quality chocolate & slowly savor one small portion a day while I sit & relax; meditation with chocolate; LOL! Thank you for sharing such wonderful information and recipes! All those Terrasoul goodies sound so yummy!!! I have been meaning to switch to raw cacao and if I win I have no excuse! 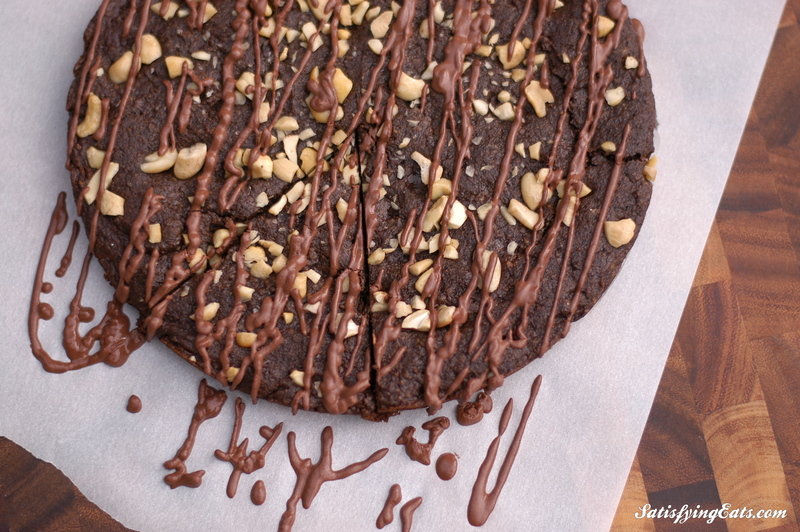 I just shared the contest and love a good brownie! I would like to try this using pumpkin seeds. Will the ground seeds equal 1 cup like the almond flour? Yes Carmen, 3 oz is approximately 1 cup of almond flour so I used 3 oz of ground pumpkin seeds and it was perfect! Let me know how it turns out! thanks, can’t wait to try it!! The 80% cocoa bar contains sugar. What can you substitute for that? Maggie, use whatever chocolate bar you like. I used to make my own chocolate chips using stevia, unsweetened chocoalte & coconut oil but some complained of them being bitter and they spread everywhere when baked. The 80% cacao bar is my happy medium. Minimal sugar, no soy, no dairy and they don’t melt everywhere when baked. What is the difference in flavor or use between the unfermented and fermented cacao nibs? Did you use the fermented nibs in this recipe? I made this today with many exceptions, but did the best I could, and I am very slow in the kitchen! I used Hershey’s Special Dark for my Cocoa Powder, no mesquite powder or cacao nibs, an extra large egg, butter, 85% cocoa bar, left the nuts off because hubby would not want them, and forgot the sprinkle of salt at the end. I used Traders Joe’s Organic for my stevia – same amounts, and forgot to taste, so I forgot the palm sugar too! I had not softened and mixed my coconut cream concentrate, so didn’t has the chocolate drizzle either! Result is Very (dark) chocolaty! Hubby is in the 1% that doesn’t die for chocolate but he ate some. 1st piece totally disintegrated on attempting to remove. Maybe too hot still. 2nd pie-shaped piece held together except for the center inch. With all of the differences in what I used, I don’t if it is possible to pin-point the reason for the crumbling. Served it with whipped topping since I didn’t use the drizzle. Think I am going to have another piece and that will be lunch! I am going to have to freeze this if it going to last, and I don’t have to share with anyone! THIS LOOKS AMAZING, I LOVE CHOCOLATE!.